How often do I need to see my midwife during pregnancy? Every woman and pregnancy is different, so some women need access to more appointments with their midwife than the recommended amount. For first-time mothers, between 10 and 11 appointments are recommended. This includes your booking visit, which should be carried out by 10 weeks of pregnancy. For women who have already had a baby, between seven and eight appointments is recommended. Your health care provider should assess your individual needs and make a plan with you regarding how many appointments you should be offered and the timing of these appointments. What tests will I have during pregnancy? Blood tests to check your haemoglobin (iron) levels, whether you have any infections and your blood type. A dating scan between 10 and 12 weeks, where markers for Downs Syndrome can also be checked. Blood screening tests for genetic disorders, such as Downs Syndrome, are offered around this time, too. 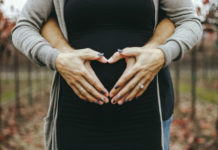 At around 20 to 22 weeks, you should be offered a detailed anomaly scan, which shows your baby is healthy and looks at where your placenta is situated. At 28 weeks, you should be offered a repeat haemoglobin test to check your iron levels and any antibodies in your blood. How can I manage my morning sickness? Morning sickness is a very normal symptom of pregnancy, but it can make those first few weeks difficult. Many women find that eating a few crackers before getting out of bed in the morning helps to stop the worst of the nausea. You might also try eating smaller meals more regularly or snacking on some crackers or fruit between meals. Spicy or fatty foods can intensify symptoms of morning sickness, so try eating plain food and see if it makes a difference. Try to keep hydrated by taking small but regular sips of water through the day. Often drinking large quantities at a time can upset your stomach further. Some women find taking ginger or vitamin B12 is helpful. Ginger can be consumed in tablet form, in food or as a tea. Vitamin B12 is available in most pharmacies and health food shops but talk to your health care provider about the correct dosage for you and your baby before starting to take them. Finally, travel sickness bands can work really well for some women, as can acupressure and acupuncture. 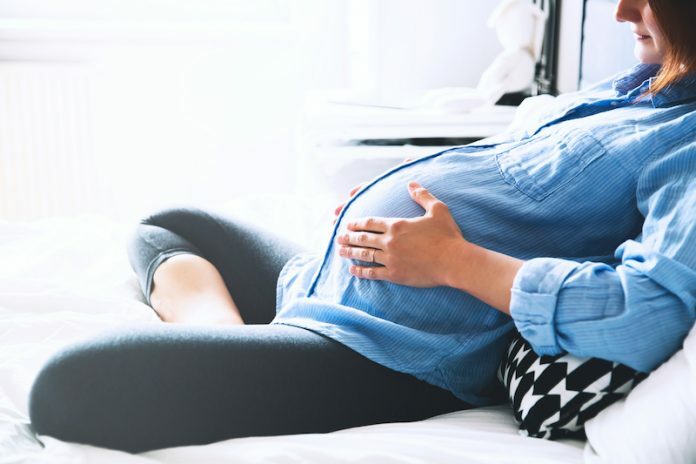 Morning sickness is completely normal, but some women experience hyperemesis (an inability to keep down any food or water for long periods of time, and sometimes for the duration of pregnancy). Hyperemesis is not normal, and you should speak to your health care provider if you think you are experiencing these symptoms. What lifestyle changes should I make while I’m pregnant? Reduce caffeine – less than 200mg per day is the current recommendation (about two cups of coffee or tea a day). Exercise – start a light routine, such as walking, swimming or yoga. 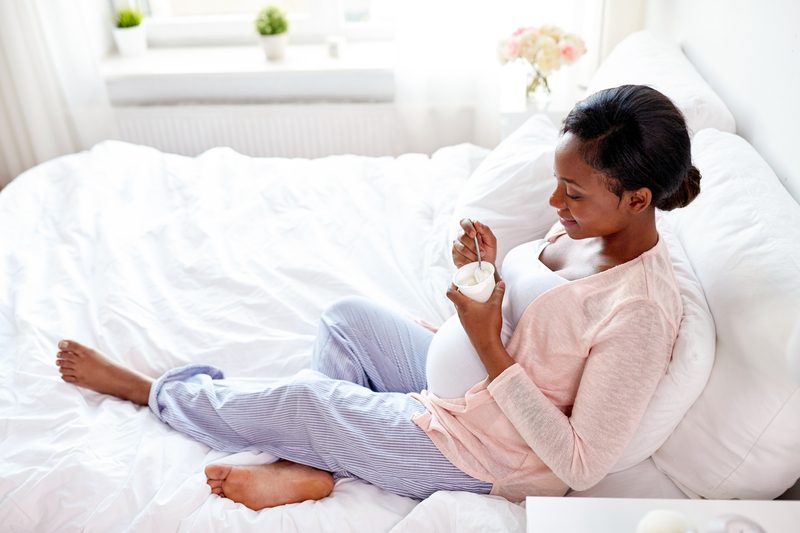 What food should I avoid during pregnancy? Food risks are low, but it’s good to be aware of what you should be careful eating. Currently it’s recommended to avoid unpasteurised milk, cheese, yoghurts and blue cheeses. Foods high in vitamin A (such as liver) should not be consumed frequently, and avoid vitamins with vitamin A as high blood levels can cause problems for your baby. Pate, cured meats and undercooked meat are best. The risks are low but they may contain bacteria that can be harmful to you and baby. We also recommend avoiding uncooked eggs and soft yolks, and make sure your food is cooked through and piping hot, especially ready meals. When should I go on maternity leave? Most women start maternity leave between 36 and 38 weeks of pregnancy, if they are well and that their job is suitable in late pregnancy. How many people can I have in the delivery room with me? This is dependent on your chosen place of birth. In most hospitals, your birthing partner and a doula are welcome, but do check the policy at your unit. If you choose to birth at home, you should be able invite whoever you choose. Have a chat with your midwife about your wishes and she can help you to make a plan. Is it safe to travel overseas when pregnant? Absolutely. There are some areas of the world that are not advisable to travel to, after the recent Zika virus concerns you may want to consider staying away from the South American countries affected. Always check the Government’s foreign travel advice for up-to-date information on your destination, and bear in mind that you might require vaccinations for some destinations and they may or may not be recommended in pregnancy. Check with your travel provider regarding their restrictions on pregnant passengers. Most airlines are happy until 36 weeks, but there are exceptions to that rule. And don’t forget you need to travel back home, so make sure you’ll be safe to do so. Talk to your health care provider about precautions you might need to take, such as wearing travel socks, drinking bottled water or if any vaccines or medications are advised. What does it feel like when my waters break? There are three ways that your waters can break. The first and most likely is called a hind water leak. In this case, you may feel a small gush of warm water followed by a trickle that continues, or you may simply notice your underwear is wet and you may have to wear a pad. It’s unusual to feel anything with a hind water leak, but you should still let your health care provider know. The second way is called a forewater leak. This is usually a big gush of waters, followed by a notable trickle or lots of small gushes that continue until baby is born. This is most likely to happen during labour, and often just before baby is born. You might feel a pop or a release of pressure when it happens. Your midwife or doctor might talk to you about breaking your waters to bring on labour (induction) or speed up your labour. Ask them about the risks and benefits of this procedure before you agree. Having your waters broken involves a vaginal examination and the medical professional will then break your water sack with a crochet hook like device. Vaginal examinations can be uncomfortable, but the act of having your waters broken shouldn’t be felt at all. You will of course experience a gush of warm water immediately, and your waters will continue to leak for the duration of your labour. Sometimes your waters do not break, and that is fine too. A few babies are born in their water bag and this is called an en caul birth. In this case, your midwife will break the bag after your baby is born. How frequently do people poo while they’re giving birth? People poo during labour about 50 per cent the time. The main thing to remember is that your midwife will clear it away quickly, and nobody cares. It’s completely normal and midwives find it’s a great sign, it usually means baby will be born very soon and you’re doing fantastic work. How common are emergency c-sections? An emergency c-section is defined as any c-section, which was not planned, which means that many c-sections that are termed as ’emergencies’ weren’t actually an emergency at all. How common are natural births? The Birthplace study, 2011, is the best guide we have to overall statistics around childbirth in the UK. If we assume the definition of a natural birth in this case is a vaginal birth without intervention (no use of induction, epidural or spinal, general anaesthetic, caesarean, forceps, ventouse or episiotomy), the rates for healthy first-time mothers varied depending on place of birth with statistics showing normal birth rates as 46 per cent in hospital. This increases to 63 per cent in a birth centre, 69 per cent in a planned home birth, and 71 per cent in a freestanding birth centre. 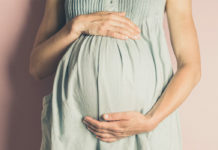 For healthy second-time mothers who did not have a previous c-section, the rates varied from 79 per cent in hospital, 91 per cent in an alongside birth centre, 95 per cent in a freestanding birth centre and 96 per cent in a planned home birth. However, rates do vary considerably between providers, so it’s always worth doing a little research around your options before you book with care with a provider.